Jess Davies is the victim of a raging feud he doesn't understand. He must fight to survive as he struggles to accept the twisted circumstances of his birth. Meanwhile, Alexandra Byrnehouse, shattered by the events surrounding her father's death, is forced to turn to her family's oldest enemy in order to keep body and soul together. When Jess Davies and Alexandra Byrnehouse meet, they unwittingly take on decades of mistrust, deception, and deep betrayals of the heart. Together they are confronted with arson and murder as they discover unbelievable secrets that first bind them to each other, then tear them apart. If they are to survive, they must learn that passions cannot be chosen-and only the most perfect love can heal the deepest scars. 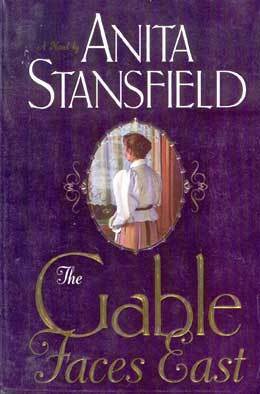 The Gable Faces East is a true masterpiece of historical romance fiction-one of Anita Stansfield’s finest! This book is so full of drama, mystery, intrigue, pain, and an undying love. I was literally gripped at every page. When I wanted more and the author gave it to me. I love period drama's and this delivered on so many levels. The characters are very well developed. It is like you know them on every level possible. They are so well rounded. I've also fallen in love with Jess. He is a man among men! Swoon! This book takes place in Australia on a horse ranch. Say no more! I needed to have it. It has a historical setting. Think late 1800's.Perfect! While I was reading I was falling more in love with the characters, the house, ranch, and Australia all in one. The story isn't just about the love. I mean, there is a seriously good plot here. The love story is neatly wrapped up in all its goodness around the story. It is masterfully crafted. This is a legitimate love story. Epic really. Romance novels are pretty predictable but not this one. I was literally shocked at some points. What?! That's not supposed to happen! Got me to keep turning those pages. This proves to be THE best I've ever read! You MUST read it! I'm pretty sure it is out of print, but it is available on Kindle! So, go grab it!!! Note: This is a perfectly clean romance novel. I'd let teenagers read it. "You can't possibly train a horse in skirts," he stated with a demeaning tone, as if it fully represented a problem." "I don't intend to," she retorted, and again his left eyebrow went up. "If you had any sense, Mr. Davies, you would concentrate more on my abilities than my apparel." To see more Romance Week stop on by For Love and Books and tell her I sent you!